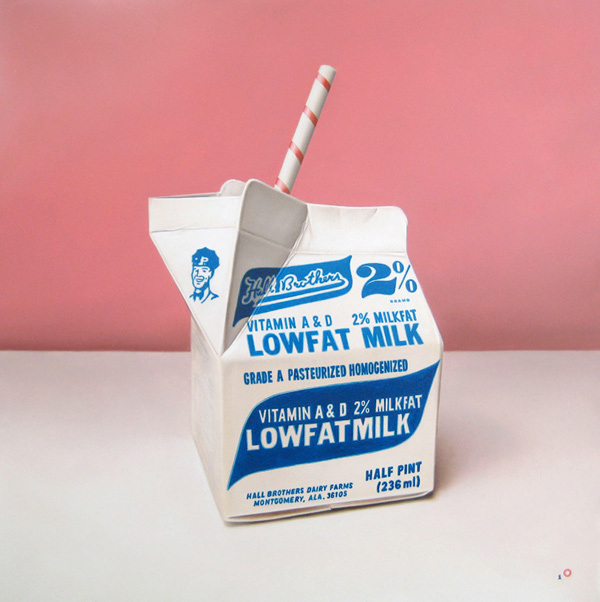 Otto Lange :: milkman :: oil on cradled panel :: 18-in. x 18-in. I love this oil painting by Otto Lange ... I love the bubble gum pink and bright blue. The obvious place to hang this in a home would be in the kitchen. But where else could you/ would you hang this painting? I was thinking the bedroom, Jenny ... maybe not even hubby's side of the bed. If it were larger - like 36x36" or more - (the painting is only 18x18") I would say above the bed. I like it for a nursery/kid's room ... baby girl especially. Then the other milkman one (which is mostly red and blue) for a boy's room. Kind of appropriate hanging art with milk on it in a baby/kid room. Don'tcha thnk?